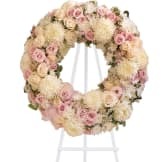 Family and friends will recollect how special their loved one was with this gentle and timeless circle of fragrant blooms to celebrate sweet memories. • A mix of flowers such as peach roses, gerberas and carnations, pink asiatic lilies and lisianthus, purple limonium and lavender larkspur nest in greens on an easel-mounted wreath. 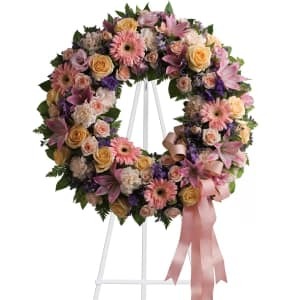 • This wreath measures approximately 22 1/2" in diameter. 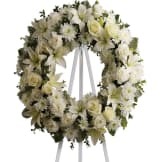 Flowers will be received by a Korsmo Funeral Service's staff. All of our flowers are designed and delivered by hand from a local florist in in Moorhead.